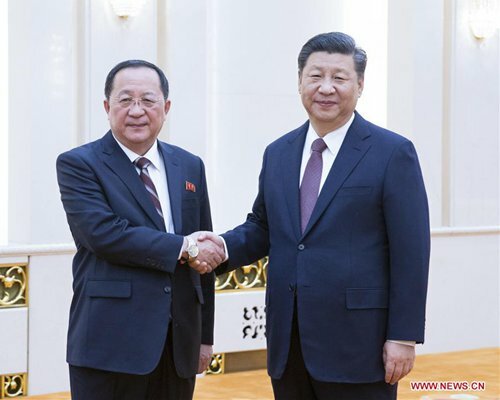 Chinese President Xi Jinping met with North Korean Foreign Minister Ri Yong-ho in Beijing on Friday, and called for more efforts to advance the long-term, healthy and steady development of bilateral relations. China supports North Korea in seeking development routes that suit the country under the leadership of Kim Jong-un. 2019 marks the 70th anniversary of the establishment of diplomatic relations between China and North Korea, and the two sides should take the opportunity to promote healthy and stable bilateral relations, Xi said. Lü Chao, a research fellow at the Liaoning Academy of Social Sciences, told the Global Times that more and diverse cooperation between China and North Korea can be expected in 2019. "North Korea wants to focus on economic development in the future, which China fully supports and can offer useful lessons. Good cooperation with China could facilitate the fast development of North Korea," said Lü. Xi also said at the meeting with Ri that the Korean Peninsula issue has returned to the right track toward political settlement this year. He hoped North Korea and the US can meet each other halfway and address each other's reasonable concerns. Ri's visit comes after Xi met with US President Donald Trump at the G20 summit, during which the two sides agreed to maintain communication on the Korean Peninsula issue. Lü said the timing of the foreign minister's visit reflects that North Korea thinks it's necessary to conduct "strategic communication" with China to better push for the denuclearization of the peninsula and learn about the consensus reached at the meeting. Despite the continued progress of the Korean Peninsula issue, experts said that uncertainties in the US side will somehow increase challenges. Lü said that the easing of tensions on the Korean Peninsula won't be reversed, which is the consensus of most people, even when the peace and denuclearization process meets some obstacles. "The US keeps pressing North Korea which leads to some backlash from North Korea. The excessive pressure the US has put on North Korea is unreasonable. After North Korea made some efforts, the US should show some kindness, like lifting some sanctions," Lü said. Zhang Huizhi, vice dean of the Northeast Asian Studies College at Jilin University, said "North Korea is clear in pushing forward denuclearization and economic development. In contrast, the US still harbors some uncertainties. It still uses the joint military drill [with South Korea] to test North Korea." Ri also met with Chinese State Councilor and Foreign Minister Wang Yi on Friday. During the meeting with Wang, Ri said that he hoped North Korea and the US can build mutual trust. Ri highly appreciated China's effort in solving issues on the peninsula, a statement by China's foreign ministry said. There are concerns the arrest of Huawei senior executive Meng Wanzhou, in Canada at the request of the US, may also cast a shadow over the consensus reached on the Korean Peninsula by China and the US, but both Lü and Zhang said it won't stop the peace process. Lü stressed that China never linked the trade war with the US and the Korean Peninsula issue together. "But if some people in the US think of using the trade war to press China on the Korean Peninsula issue, it will only make the current situation more complicated and obstruct the denuclearization process," he said. He added that China and the US have more room to cooperate in addressing the Korean Peninsula issue. CNN reported on Monday that Trump said he expected a second meeting with Kim in January or February. Zhang said that the meeting will very likely happen. She predicts that there will be an agreement reached at the meeting, which will be beneficial for the Korean Peninsula.